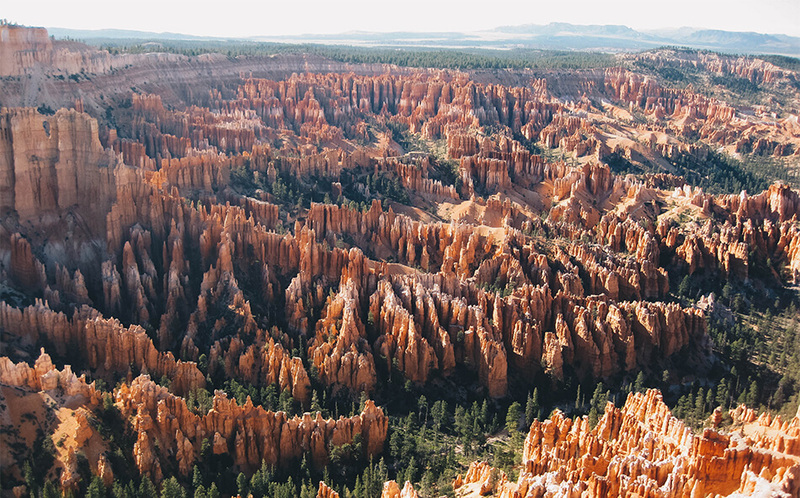 Nothing prepared us for the absolute magnificence Mother Nature created in Bryce Canyon National Park. We headed there straight after hiking Angels Landing in Zion National Park, not able to wait a second longer to contemplate the explosion of colours that paint the extra-terrestrial landscape. 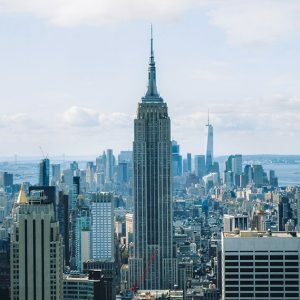 Once again, Pinterest and Instagram had done a wonderful job, skyrocketing our expectations. 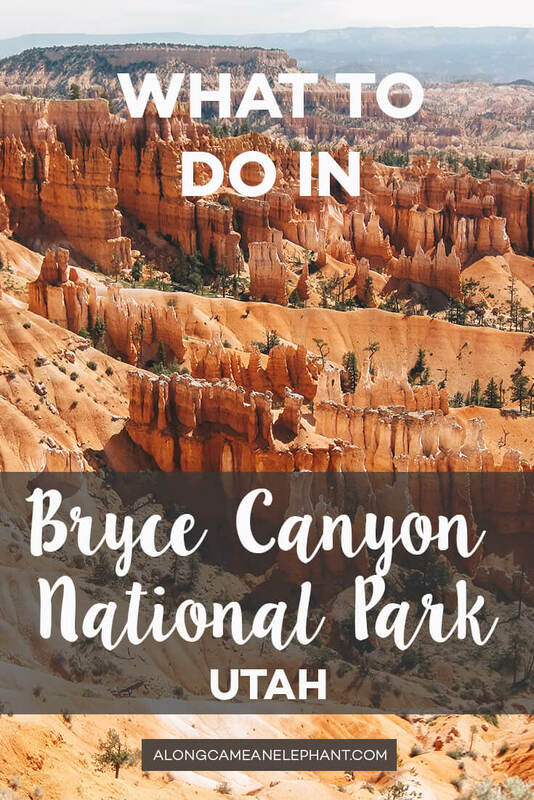 Here are our recommendations on what to do at Bryce Canyon in one day. 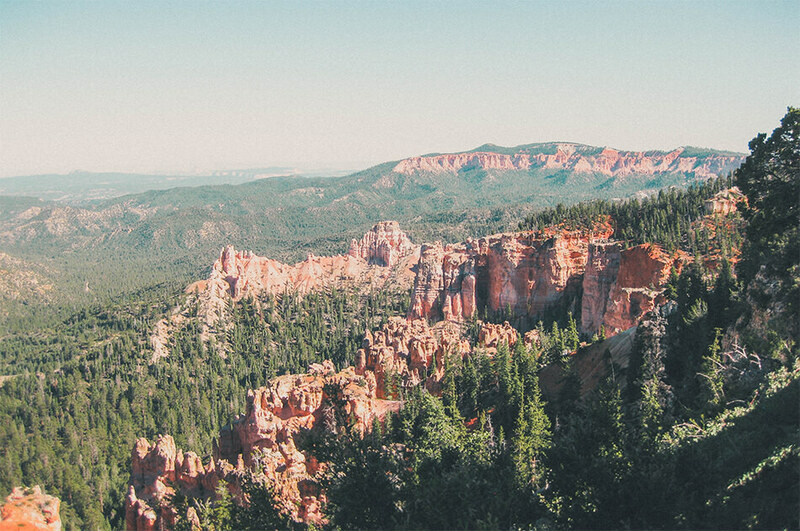 The drive from Zion National Park to Bryce Canyon National Park was hands down one of the most epic scenic drives we’ve ever driven… absolutely gorgeous! Once arrived at our hotel, we still had a couple of hours until dinner time and decided to try to see some of the famous viewpoints before it got too dark. 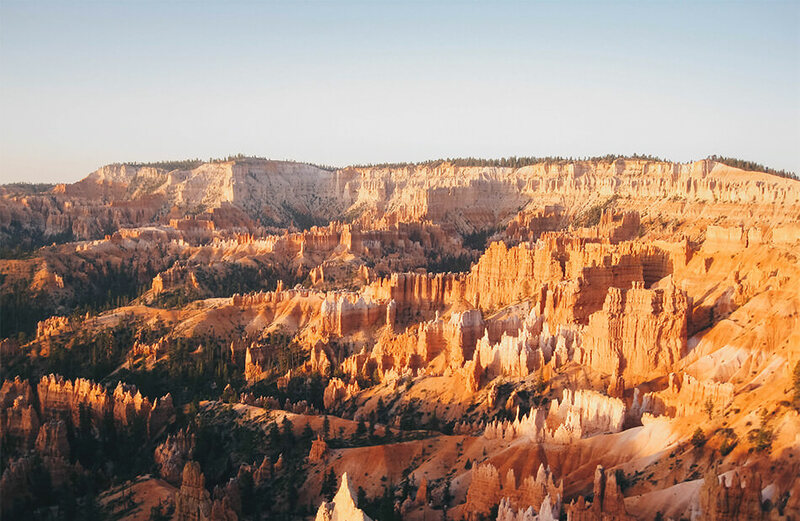 One of the best ways to see Bryce Canyon is to drive the Bryce Canyon scenic drive. 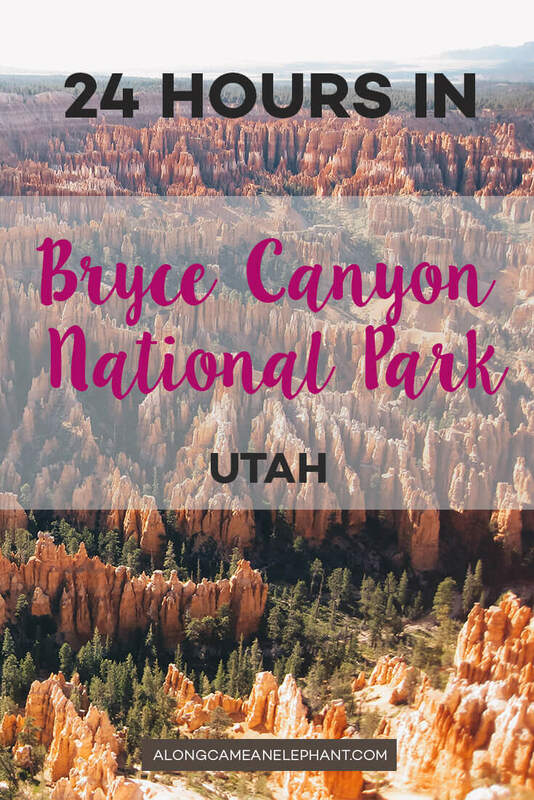 Unlike some of the other national parks, like Zion where you have to take a shuttle bus in order to get to the viewpoints, you can drive to all of them yourself in Bryce Canyon. We spent the next two hours chasing the sunshine and visiting as many viewpoints as possible. 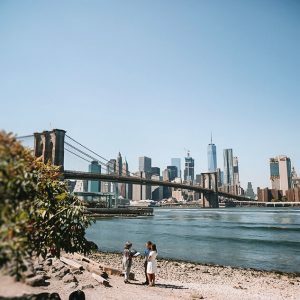 We were able to enjoy all of the park’s major overlooks in a rather short amount of time as you basically just get out of your car and take a leisurely stroll out to the edge of the pavement. No need for serious hiking. The 18-mile scenic drive offers several pull-outs and viewpoints, lining the edge of the main amphitheatre, which can become quite busy during peak season (July and August). We definitely wanted to see the most popular viewpoints like Sunset, Inspiration point and Bryce Point. 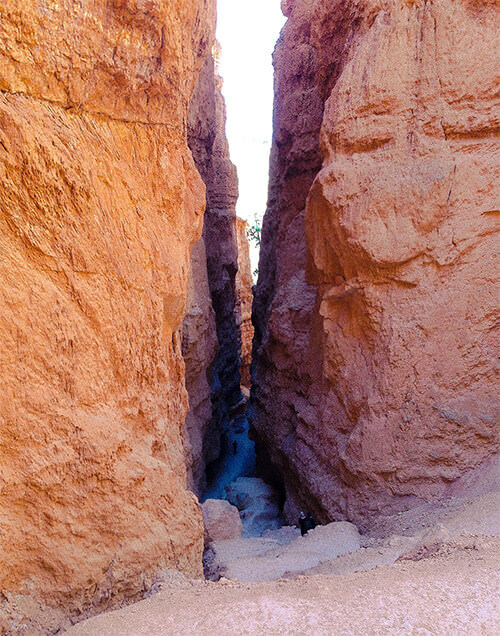 Not many visitors continue south past Bryce Point but we loved Natural Bridge, Agua Canyon and Rainbow Point. The amazing hoodoo viewing made for a perfect first half day at Bryce Canyon. 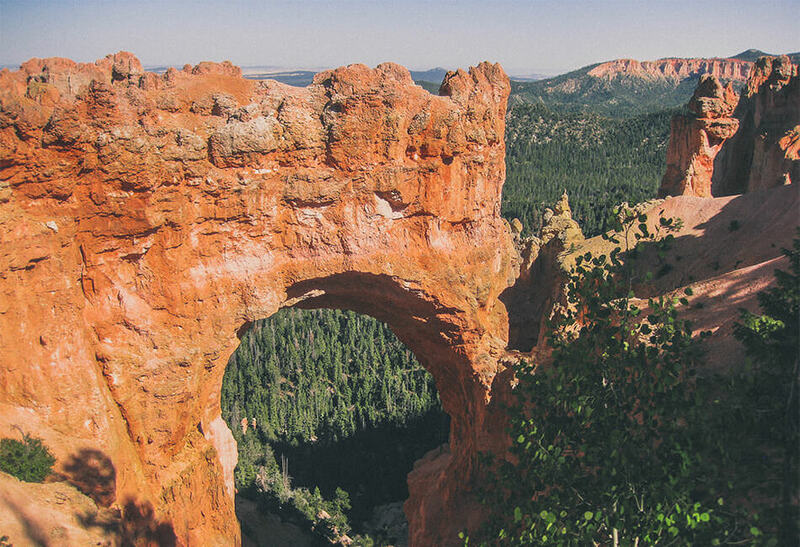 Our first look over the Bryce Canyon amphitheatre took our breath away. I mean, we were gobsmacked, our mouths dropping open and forming the perfect ‘O’. It must be one of the most out-of-this-world natural landscapes we’ve ever seen, even surpassing the extra-terrestrial landscape of the Quiraing in Scotland. 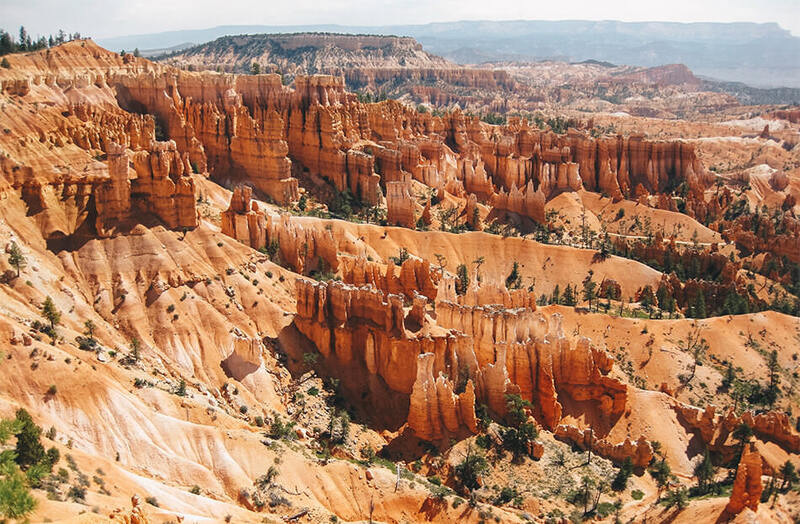 If you’re limited in time, the Bryce Canyon scenic drive is a superb choice and can be done in half a day either by driving your own car or riding the convenient free shuttle bus. The next day we had a 2,5h drive to Page on our agenda where we wanted to tick Antelope Canyon and Horseshoe Bend off our to-do list. This left us with an entire morning to explore the famed Bryce Canyon hoodoos. 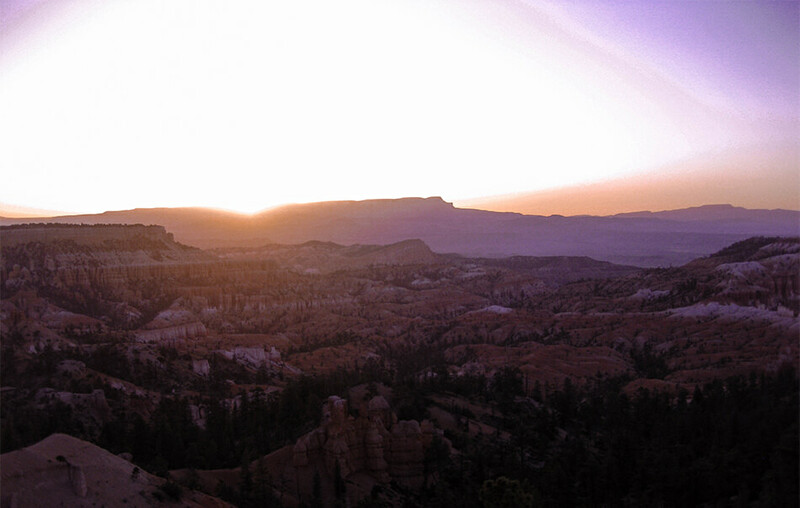 Morning came and we arrived first at the scene in order to catch the earliest sunbeams at Sunrise Point. The moment the first streaks of daylight peak over the Amphitheatre walls and highlight the golden colours of the oddly shaped hoodoos below, is simply magical. The viewpoint was quite crowded but there seemed to be a common understanding to enjoy this moment in pure silence with only the sounds of nature as a background soundtrack. Though still drowsy from sleep, excitement for our nearing hike through the enchanted forest of hoodoo clusters below got me all giddy and excited! After a quick return to our comfy bed in order to catch up on some well-deserved zzz’s, we prepared ourselves to hike down into the field of hoodoos. 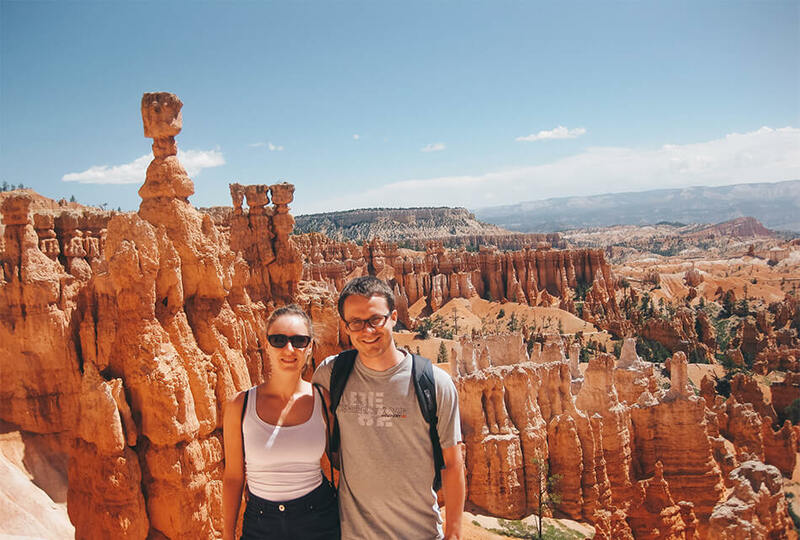 We’d seen amazing photos from the Navajo Loop trail and were thrilled to get up close to some of the famous rock formations like Thor’s Hammer. Slowly descending into the canyon we realized how tall these skinny spires of rock actually are. They seem so small from up above! Check out this video by At Home In Wild Places of the Navajo Loop and Queens Landing trail for an impression. These spires seem to change from different angles – one moment they’re shrouded in a purple haze and look like fairies and other mythical creatures might actually live here, and the next the sun turns the canyon into a hellish landscape where alien life might be lurking behind the corner. We had indeed embarked on the Navajo Loop trail which we combined with the Queen’s Garden Trail. The trail is considered one of the best trails in the world and we absolutely agree. You can walk between hoodoo clusters and even through them via obvious man-made openings in the limestone rocks. Sadly we just missed the remaining snow (in June!) 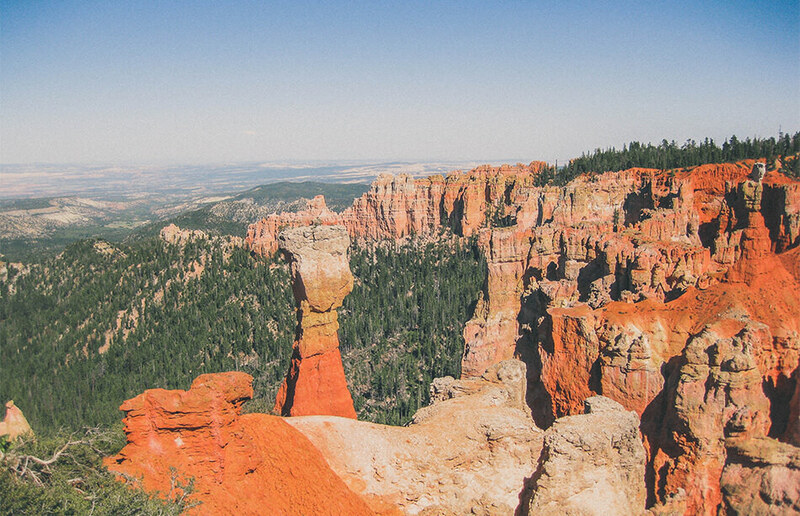 which would only have added to the extraordinary experience we had in Bryce Canyon National Park. The route is fairly easy with a steep incline at the beginning and steep ascent at the end, giving you reason to pause, take a breath and take in the astonishing views. Oh, and of course immortalize this moment by taking the most amazing photos you’ll take during your Southwest road trip. Bryce Canyon National Park is located in southwestern Utah off of UT-63. When coming from Zion National Park, you’ll drive one of the most amazing scenic drives we’ve cruised so far! 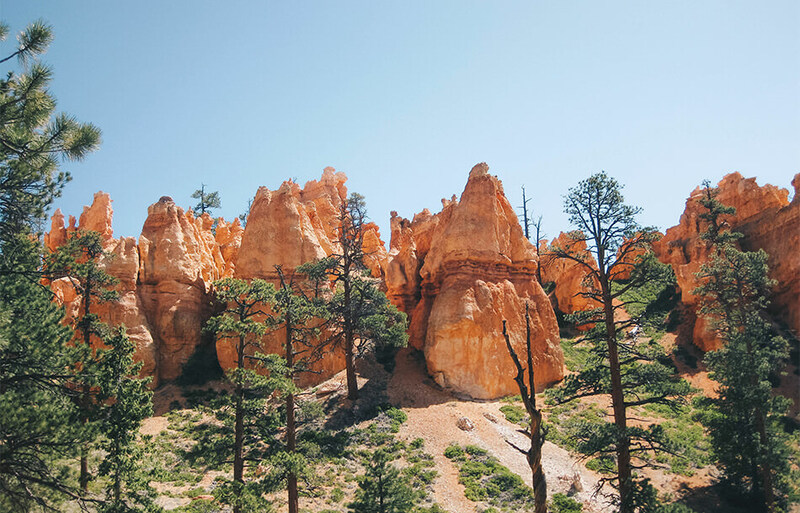 From mid-April to November, Bryce Canyon National Park offers a free shuttle service to all the major viewpoints in the park. You aren’t required to use the shuttle here like you are at some other parks (like Zion and the Grand Canyon), meaning you can still choose to drive your own car if you want. Just be aware that during peak season, the parking areas at most of the viewpoints are very small and fill up quickly. There are not too many hotels right near the entrance to Bryce Canyon. But if that’s where you want to stay, your best bets are Best Western PLUS Ruby’s Inn and the Best Western PLUS Bryce Canyon Grand Hotel. Both are just minutes from the entrance to the park. If you plan on catching sunrise, don’t forget to set your alarm clock at the crack of dawn and take a fleece blanket or warm sweater with you as it can be quite cold. When you plan to go hiking, bring some hiking shoes, especially when there is still snow in the canyon. The sand will turn quickly into mud and you’ll thank me for not going out and about in you tennis shoes. 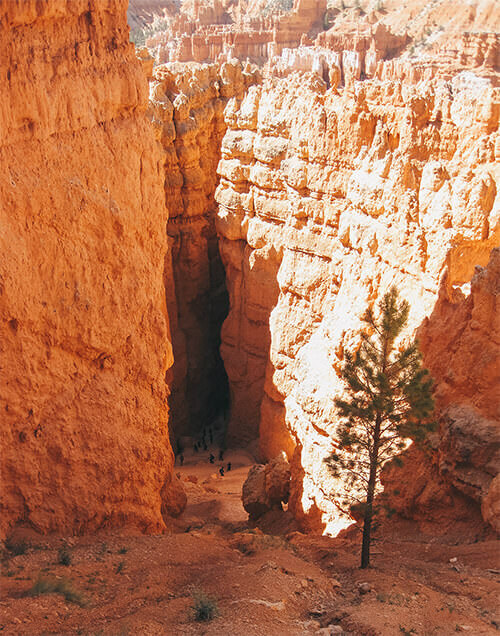 Also, Bryce Canyon is at a pretty high elevation, which means it can often be chilly – even during the summer months. 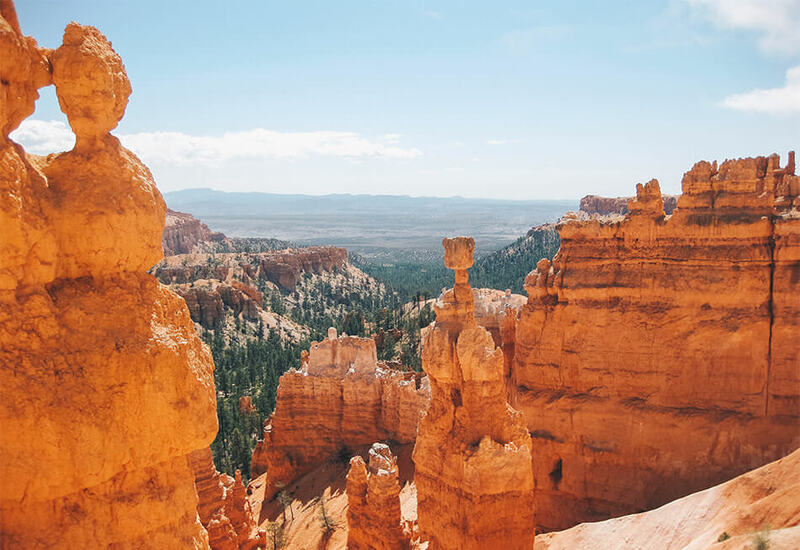 After seeing all the above photos, you might not be surprised to hear that we think Bryce Canyon National Park deserves some of your time when on a road trip through the Southwest. 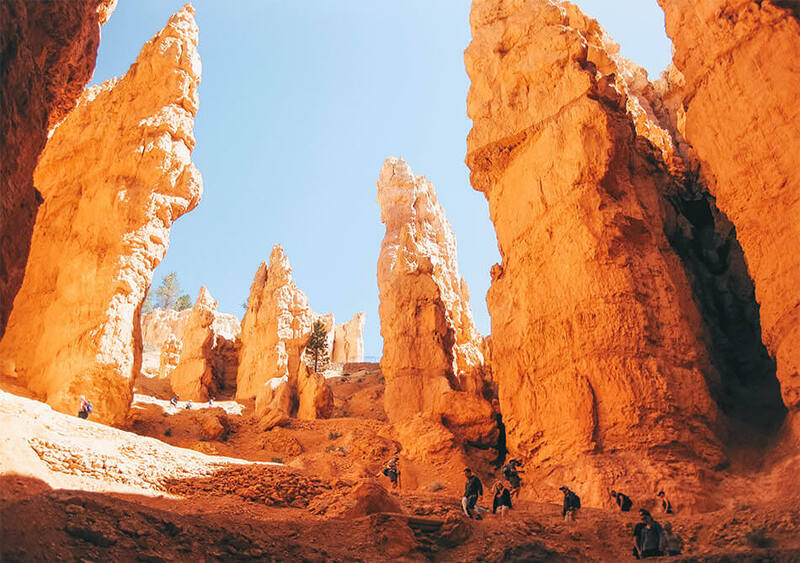 One day in Bryce Canyon is largely sufficient to cover the main viewpoints and get up close with the out-of-this-world looking hoodoos. It’s pretty darn unique as far as national parks go! 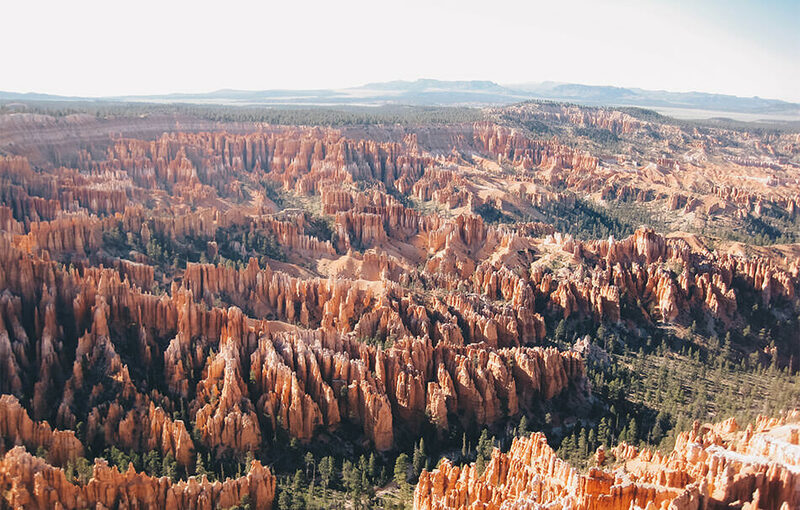 Have you ever been to Bryce Canyon National Park? If not, would you like to go? Oh, that is so far away from me 🙁 European guy here. It is a Paradise for a photographer. I know! We're European too, from Belgium to be exact. 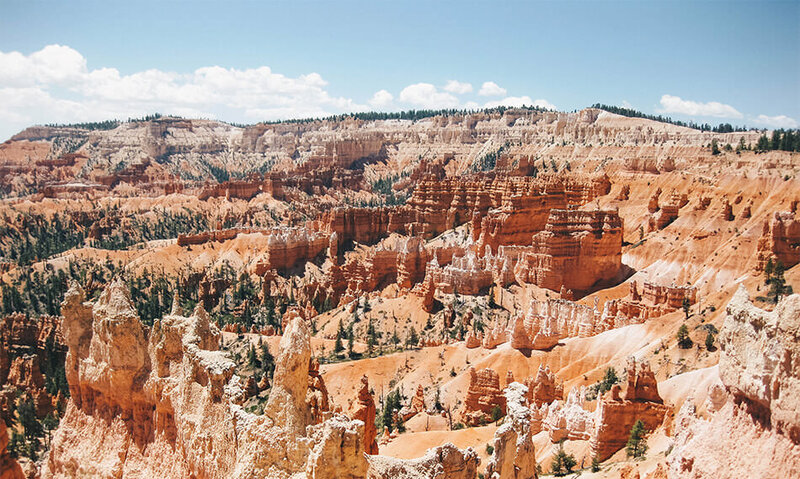 But if you're planning an American road trip, Bryce Canyon National Park should be on your list! I went here just after high school and it was such an amazing place. 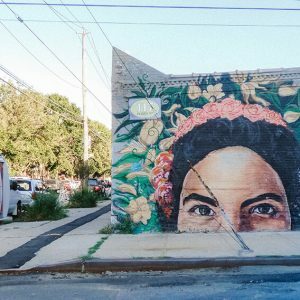 I want to go back after reading this. Your photos are gorgeous. Your photos are spectacular!!! I was just there beginning of September although we were rushed on time and only did the drive through the park plus stop at some viewpoints. The hike down to the hoodoos seems like quite the experience too. Definitely gonna revisit again so I can do it myself as well! Thank you so much! If you have the chnace to go back, you def should!